This modern-looking side chair’s clean lines and natural colors elevate the look of any room. And the ergonomically shaped seat is designed to go easy on your back. Black wires interconnect the wooden legs for stability, but they also add great aesthetic value. This chair would go equally well in front of a desk or around a dining room table. This cream-and-black, Turkish-made rug has a fun pattern that mimics a handmade screen-print. The rug is certainly beautiful, but it’s also made for high-traffic areas. The durable material is easy to clean — and that’s great news if you have kids or pets. Set the tone in your living room with this glamorous two-piece coffee table set. Both tables have the same design — a sleek glass top perched on a gold, geometric base. You’ll be excited to display your magazines and books here just to draw people’s eyes. From Joanna Gaines’ Magnolia Home Collection, this big pillow is sure to dwarf the others on your couch. Measuring in at 22” x 22”, it’ll be a comfy addition to your nights with Netflix. Plus, the thick, textured surface adds a down-home charm to your living room. Why just place your plants on a table when you can elegantly hang them from the wall? These cool, geometric planters display tiny plants, like succulents, air plants or small cacti, without taking up any space in the room. The white ceramic planter and gold metal framing keep the chic vibes going. It can be difficult to find a mass-produced piece of wall art that you actually want to look at every day. This one displays the eye-catching, abstract design of a geode. The swirling, muted colors add some contrast to a living room flush with sleek, minimalist lines. Bring a beachy feeling to your home with a handwoven basket made of Indonesian seagrass. The tan-and-white-striped design matches most surrounding colors and keeps your space calm. Park a potted plant in it or use it as an umbrella holder in your entryway. A ladder bookcase does the job of displaying your knick-knacks and books while still keeping the room open and airy. This white version features tiered shelving that doesn’t take up a huge footprint in the room. It looks delicate but has sturdy construction that you can trust. Metallic pineapples are having a moment in the design world and now you can make one a fixture in your home with this lamp. The pineapple-shaped base comes in a brass finish and can be combined with most lampshades. 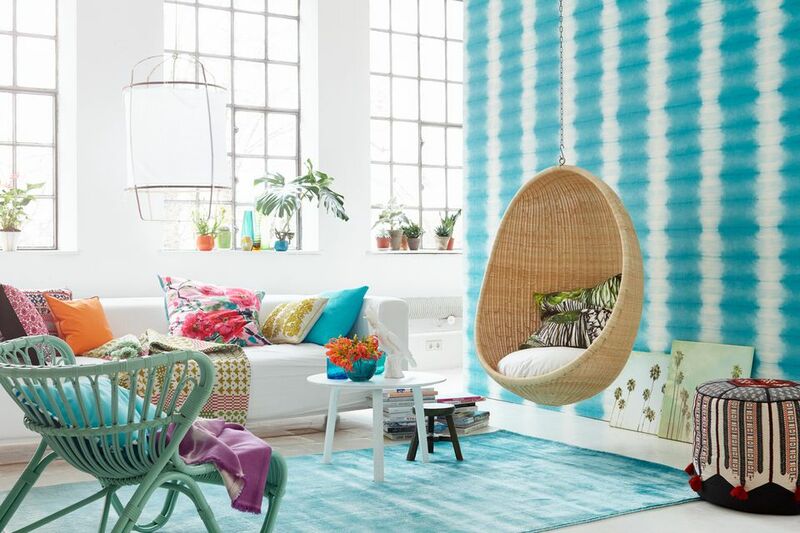 Put it in one of your most-used rooms so you can envision a tropical paradise every time you see it. Do something different with your greenery by suspending it from the ceiling in this vintage-inspired plant hanger. It’s handcrafted and can fit planters of different shapes and sizes. Hang a few in the same area to create a focal point for the room. The size of this couch is a perfect fit for a cozy apartment. Measuring 78” arm to arm, it’s bigger than a love seat but more compact than a full-size couch. With clean lines, tapered legs and a mix of leather and wood, this couch’s modern design contributes a classic look to your living room. The contrast between this table’s round, marble top in alabaster white and its triangular metal base in muted black is a real attention-grabber. Let’s call this a statement table: It’s sleek and modern, but won’t just blend into the scenery. This table would go great in an entertaining space or in a style-savvy home. This mirror works overtime as modern metal wall art. The frame is made of thin metal circles in a rusty golden hue. Don’t be fooled by its delicate look: This mirror is built to last, even in a hectic and high-traffic part of your home. Plus, the open spaces in the frame make this mirror easy to hang. Looking for more surface area to display your stuff, but want something more stylish than a simple wall shelf? This grid-pattern shelf provides twelve separate spaces to give your favorite pieces the spotlight they deserve. This shelf is a great solution for using more vertical wall space, especially in smaller rooms. This rustic storage cabinet showcases the beauty of unvarnished wood with a visually stunning chevron pattern of light and dark pieces. The cabinet doesn’t have handles — just finger pulls — for a simple, uncluttered look. Use the interior three shelves to store ​serveware in your dining room or place the cabinet in the living room to use as an upscale TV stand. This lantern works just as well in a modern loft as it does in a provincial stone cottage. The thin, antiqued zinc frame looks worn, as though this lantern has been passed down through generations. One glass pane is hinged and opens fully, allowing you to easily place a candle inside, light it, extinguish it and replace it with a new one. For those looking for luxury and libations straight out of the 1920s, this bar cart is a must-have. It boasts a polished frame in metallic gold finish, a glass top shelf for maximum visibility and a mirrored bottom shelf to turn your liquor bottles into accent pieces. The cart is on wheels to easily roll through your next Gatsby-themed party, and safety castors on two wheels lock the cart in place when the party’s over. Looking for a cheap and easy way to cozy up your living space? This shabby chenille throw adds warmth and welcome to any room. With its subtle striped texture and long fringe on each end, this throw turns your couch into a cozy destination. And there’s no reason to worry if it gets dirty: It’s machine-washable. Thanks to Chip and Joanna Gaines of HGTV’s Fixer Upper, we’re in the midst of a shiplap craze. Bring this trend into your home with this easy-to-install shiplap wallpaper. It sticks to the wall with an adhesive backing to create that distressed wood effect. After you put it up, you might think you just moved into a historic farmhouse. Remember the terrazzo flooring of the 1970s? Well, it’s back in style. Instead of going full tilt with terrazzo by installing a busy-looking floor, start small with these cute coasters. They don’t have the crazy colors of old-school terrazzo — that’s a good thing — which means you can mix this trend with the décor you already have. Having fresh flowers around the house is a treat, but using a traditional crystal vase can make your style look stuffy. Try this warm-toned, striped option to bring a little life back into the room. It’s large enough to hold a couple of your favorite bouquets and the colors will mingle well with whatever flowers you choose that day. What this white lamp lacks in color, it makes up for it in texture. The cylindrical base is lined with concave dots to add interest to your décor without commanding the room. You can put this lamp pretty much anywhere and it will mesh with the surrounding style. This round rattan ottoman adds a splash of cottage charm to any space. Its concave sides can provide a nice contrast to a room filled with boxy modern furniture, and its natural wood coloring can offset darker tones. Consider this ottoman as a coffee table replacement to liven up your living space. This white, gold and gray canvas can brighten up a whole room without clashing with its surroundings. With bold rectangular shapes, dark undertones and vibrant brushstroke textures, this painting is sure to captivate you again and again. Place it near a few metallic accents to emphasize its gold stripe and frame. This couch’s minimalist silhouette and gray woven fabric will blend seamlessly with your living room’s current look — no matter what rug, curtains and pillows you already have in place. It also has reversible cushions, which give the couch a second life if you have a spill. Bye, wine stains! Add a real statement to your bookshelf with this selenite bookend. Selenite is a mineral that forms natural crystal structures, adding fascinating fissures to your bookend without compromising its durability. This bookend’s curved edge softens its look and can be a great contrast to a boxy bookshelf. And because it’s made of solid material, this bookend is heavy enough to ensure that your books stay in place. Bathrooms don’t usually come with too much storage. There’s the medicine cabinet, but that’s it. So if your bathroom has room for this glam rolling cart (lucky you! ), use it. The brushed gold finish and wire basket design make this cart feel like it’s right out of your stylish grandmother’s playbook. Pile it high with towels and bath products that you can grab from the tub. If you want to add color to your couch but don’t want to go too bold, this pillow strikes the right balance. The soft blue-and-cream embroidered leaf design gives you something interesting to look at as you lounge on the couch on a lazy Saturday. Plus, the pillow feels great on your lower back. This round wooden tray has a light finish that goes well with breezy, coastal décor. Pair it with subtle colors like cream, pale blues, seagrass green and light browns. We can picture this tray holding sophisticated brunchtime drinks, party snacks or a handful of decorative plants. You choose what works for your style. Is counter space a luxury in your kitchen? Add a lot more with this modern marble-and-metal table. It’s counter height — at 3’ tall — which means you don’t have to hunch your back just to chop vegetables for tonight’s dinner. The natural marble surface gives the table a unique look (no two are exactly the same) and the black metal base maintains an open profile. You can even pull up a stool or two to create a portable breakfast bar. Magazines and record covers add their own splash of color and design to a space, so the best thing a magazine rack or record holder can do is to stay out of the way and let its contents shine. This rack does even better: It’s nearly invisible, but it asserts its own design through narrow diagonal metal bars and a hardly noticeable hexagonal frame. Filled or empty, it’s a striking addition to any room.